One of the great things about yoga is that it is so adaptable to different populations with diverse physical abilities and needs. Though the popular image of yoga may be a young person twisted up like a pretzel with apparent ease, those who are older and less flexible can enjoy a yoga practice just as much and potentially benefit from it even more. Is Yoga Appropriate for Seniors? In most cases, seniors can absolutely do yoga. Many people with hectic schedules only find the time for activities like yoga in retirement. Though the tendency is to become more sedentary, retirement is the perfect time to pick up healthy habits that will promote longevity. Attending a yoga class regularly also establishes a sense of community and friendship with teachers and fellow students. These types of social connections have been shown to be surprisingly important for maintaining health and well-being as we age. 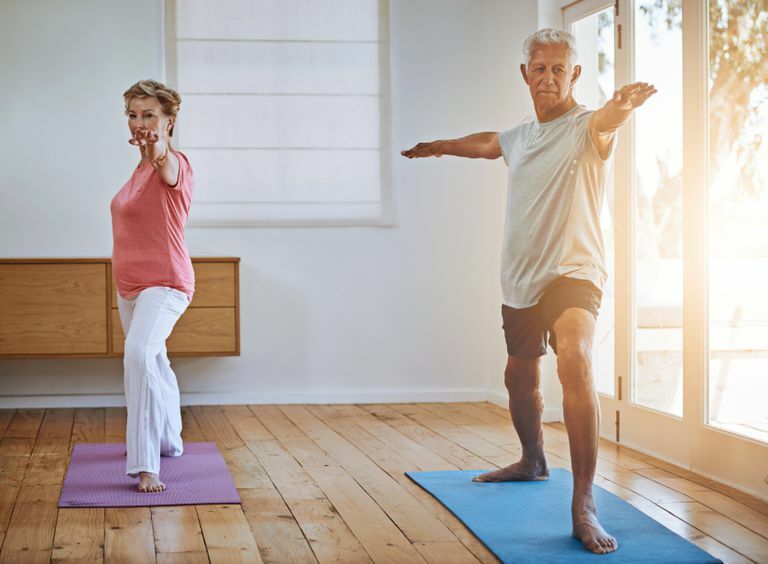 The benefits of yoga for seniors are much the same as those for the general population: increased muscle tone, balance (which is particularly important), strength, and improved mood. Through pranayama (breathing exercises), lung capacity is increased. You can expect your posture to improve and you may sleep better. If you experience stress, yoga can help counteract that too. But keep in mind that these benefits will not come overnight after a single yoga class. Regularly attending at least three classes a week will allow you to enjoy the best yoga has to offer. If you are brand new to yoga, our how to start guide offers a wealth of practical advice to help you feel more comfortable entering this new world, from basic yoga etiquette to the first ten poses you may encounter. What Kind of Yoga Should You Try? What kind of yoga is most appropriate will depend on your age, the current level of fitness, and physical ability. If you are starting to exercise for the first time (or after a long break) or have already lost significant muscle tone and flexibility, you should start with a very gentle Hatha practice. Although it is possible to learn yoga from books and videos, the best way is through in-person instruction in a yoga class. Attending classes will allow you to get the most out of yoga with the least risk of injury. Yoga classes, especially for seniors, are becoming increasingly available. Check local senior centers, retirement communities, religious organizations, and even health clubs to see if they have seniors' yoga classes on offer. If you can’t find a special senior class, a gentle beginners' class will do. Iyengar yoga, with its emphasis on making postures accessible through the use of props, is also good for older adults and many Iyengar centers offer classes aimed at this demographic. Viniyoga and Kripalu, both of which make a point of tailoring the practice to fit each individual, are also great options. Even seniors with very limited mobility can still do yoga through adaptive practices. In chair yoga, all the poses are done with the support of chairs. Water yoga is especially therapeutic since the body feels weightless and moves more easily under water. Check your local YMCA pool to see if they offer aqua yoga classes. If you have arthritis, yoga can be a wonderful addition to your treatment but necessitates greater care in finding the right class. A teacher trained in yoga for arthritis is ideal, but there are other ways to go if that is not available. Many people with arthritis find that yoga helps improve their range of motion significantly. Be sure to speak to your doctor before trying yoga, especially if you suffer from any chronic conditions or are very inactive. Those with spinal disc problems or glaucoma should take special care, as there are poses to avoid (twists and inversions, respectively).